Two types of neutron decay produce a proton, an electron and an electron antineutrino but eject them in different configurations, The experiments at NIST detected no imbalance, but the improved sensitivity could help place limits on competing theories about the matter-antimatter imbalance in the universe. Why there is stuff in the universe—more properly, why there is an imbalance between matter and antimatter—is one of the long-standing mysteries of cosmology. A team of researchers working at the National Institute of Standards and Technology (NIST) has just concluded a 10-year-long study of the fate of neutrons in an attempt to resolve the question, the most sensitive such measurement ever made. The universe, they concede, has managed to keep its secret for the time being, but they've succeeded in significantly narrowing the number of possible answers. Though the word itself evokes science fiction, antimatter is an ordinary—if highly uncommon—material that cosmologists believe once made up almost exactly half of the substance of the universe. When particles and their antiparticles come into contact, they instantly annihilate one another in a flash of light. Billions of years ago, most of the matter and all of the antimatter vanished in this fashion, leaving behind a tiny bit of matter awash in cosmic energy. What we see around us today, from stars to rocks to living things, is made up of that excess matter, which survived because a bit more of it existed. "The question is, why was there an excess of one over the other in the first place?" says Pieter Mumm, a physicist at NIST's Physical Measurements Lab. "There are lots of theories attempting to explain the imbalance, but there's no experimental evidence to show that any of them can account for it. It's a huge mystery on the level of asking why the universe is here. Accepted physics can't explain it." 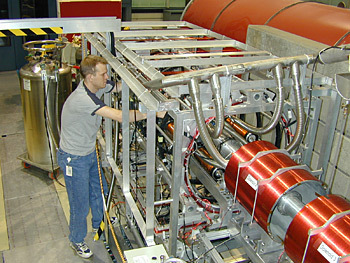 Physicists including Pieter Mumm (shown) used the emiT detector they built at NIST to investigate any potential statistical imbalance between the two natural types of neutron decay. An answer might be found by examining radioactivity in neutrons, which decay in two different ways that can be distinguished by a specially configured detector. Though all observations thus far have invariably shown these two ways occur with equal frequency in nature, finding a slight imbalance between the two would imply that nature favors conditions that would create a bit more matter than antimatter, resulting in the universe we recognize. Mumm and his collaborators from several institutions used a detector at the NIST Center for Neutron Research to explore this aspect of neutron decay with greater sensitivity than was ever possible before. For the moment, the larger answer has eluded them—several years of observation and data analysis once again turned up no imbalance between the two decay paths. But the improved sensitivity of their approach means that they can severely limit some of the numerous theories about the universe's matter-antimatter imbalance, and with future improvements to the detector, their approach may help constrain the possibilities far more dramatically. "We have placed very tight constraints on what these theories can say," Mumm says. "We have given theory something to work with. And if we can modify our detector successfully, we can envision limiting large classes of theories. It will help ensure the physics community avoids traveling down blind alleys." The research team also includes scientists from the University of Washington, the University of Michigan, the University of California at Berkeley, Lawrence Berkeley National Laboratory, Tulane University, the University of Notre Dame, Hamilton College and the University of North Carolina at Chapel Hill. Funding was provided by the U.S. Department of Energy and the National Science Foundation. * H.P. Mumm, T.E. Chupp, R.L. Cooper, K.P. Coulter, S.J. Freedman, B.K. Fujikawa, A. García, G.L. Jones, J.S. Nico, A.K. Thompson, C.A. Trull, J.F. Wilkerson and F.E. Wietfeldt. New limit on time-reversal violation in beta decay. Physical Review Letters, Vol. 107, Issue 10, DOI: 10.1103/PhysRevLett.107.102301. NIST Neutron Detection Method: Long-Sought Workaround to Helium Shortage?